The path to changing the world begins with changing ourselves. Before Lynne Dougherty opened Cornucopia, she was on a path of self-transformation. Plagued by multiple health issues for which traditional doctors had no solution, Lynne became disillusioned with western medicine. However, she found hope in holistic health. Lynne changed her diet, implemented supplements, and healed herself. Since holistic medicine was not common at the time, she had to journey beyond Long Island in search of health food stores and naturopathic doctors. Inspired by her discoveries, she decided to bring the health food movement to her own community of Sayville. Her intention was to help others realize their own potential to heal. With a little bit of money and a big vision, she started Cornucopia in 1976. Her husband built the shelves and she filled them. Building from the ground up, Lynne envisioned and brought into fruition a place for people to find vitamins and other holistic remedies. Soon, Cornucopia began to grow and offer fresh and organic produce alongside alternative medicine. Cornucopia, a symbol of ancient folklore, proved to be a fitting name as the store overflowed with abundance – so much so that she had to find a bigger space. Throughout the years, the store has moved three times since it first opened. From the first store built to it’s newest home, Cornucopia has almost quadrupled in size. The last move was the biggest one yet, spearheaded by a new owner: her son Jonathan. 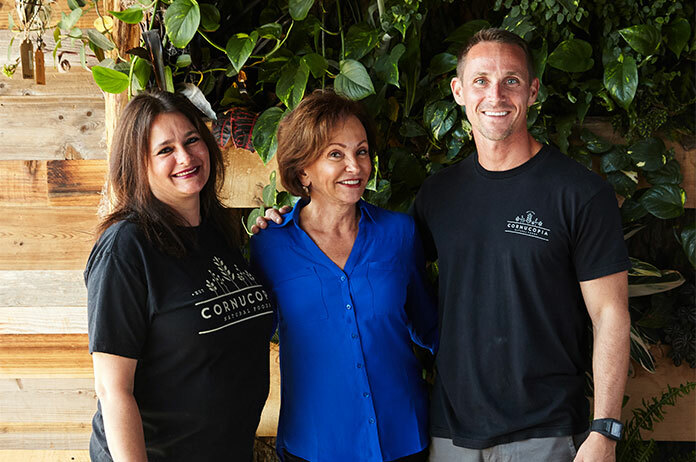 Cornucopia has always been a family affair, employing Lynne’s children and grandchildren. You can even see her great grandchildren running through the aisles today. Even more, the shelves built by Jon’s father and used in their original store still proudly showcase fresh, organic products throughout the store today. The spirit of family does not end with the Lynne’s bloodline; it touches all who work and shop at Cornucopia. We have dedicated employees who have been here for decades and loyal customers who have seen Jonathan grow from infant to owner. Jonathan has big plans to give back to our community. His mission is to use business as a force for positive change. He continues to build and maintain partnerships with local businesses and farms to support our local community. In addition, he is focused on gaining B Corp status, and has pledged to start donating a percentage of all profits to the grassroots organization, 1% for the Planet. For over four decades, Cornucopia has become a household name to people from all walks of life. From artists and athletes, to dreamers and doers, we’ve helped many on the path to change themselves. Now, we want to help change the world. In a world of Monsanto and mono-crop fields, we stand for diversity and the boundless spirit of Mother Nature. At Cornucopia, we’re growing a greener, more sustainable future – and we’re excited to have you by our side for our journey.